Dharamshala: - As recently as March 16, 2011, another instance of what appears to be Chinese media censorship took place as the popular Chinese-language Tibetan website TibetCul.com suddenly became inaccessible and still remains so. This move happened after the affiliated website MyBudala.com also was shut down only few days before the 52nd Anniversary of the Tibetan National Uprising Day on March 10. "Your statements reflect your attitude towards TibetCul. If you want our website to stir up dust, if you want it to attract the attention of the authorities and be closed down, then we shall block and close down your IP address and blog immediately." Despite this clear-cut attitude of the site's non-provocative nature and its attempts to promote cultural communication between Tibetans and Han Chinese and other ethnicities the staff at TibetCul are still unable to post on their own website. 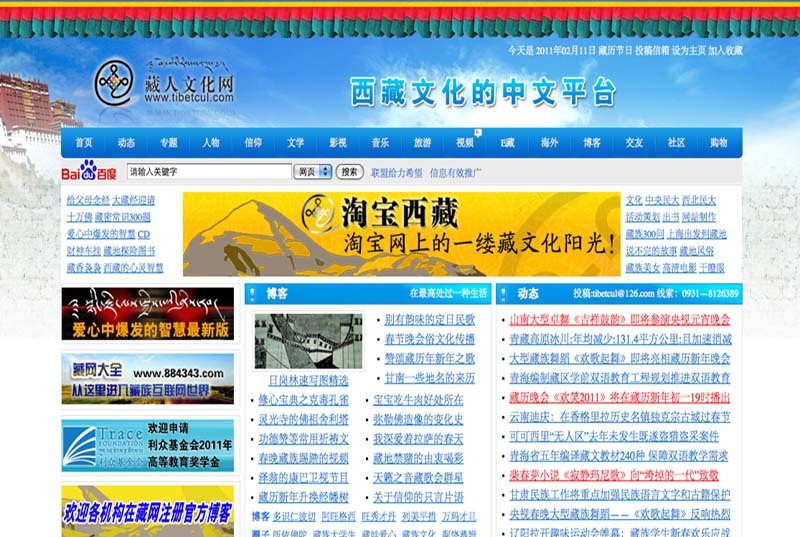 However, a post from the administrators of TibetCul was to be found on the Sina MicroBlog just after the shutdown: "On March 16 at 6pm, it was suddenly not possible to visit TibetCul's page, the website staff and server operators just found out that higher authorities ordered to close the site down, when asking for the specific reason to the authorities, the staff on duty said he had no idea why!". At the time of writing, this post has also been removed. The prospects of TibetCul to reappear on the Internet unfortunately do not seem promising, although other Tibetan websites known to be taken offline in the month of March sometimes have come back to life. If this isn't the case with TibetCul it will come to stand as another sad indication of the critically diminishing Tibetan cyberspace.